One thing was certain, that the WHITE kitten had had nothing to do with it:--it was the black kitten's fault entirely. For the white kitten had been having its face washed by the old cat for the last quarter of an hour (and bearing it pretty well, considering); so you see that it COULDN'T have had any hand in the mischief. The way Dinah washed her children's faces was this: first she held the poor thing down by its ear with one paw, and then with the other paw she rubbed its face all over, the wrong way, beginning at the nose: and just now, as I said, she was hard at work on the white kitten, which was lying quite still and trying to purr--no doubt feeling that it was all meant for its good. 'Oh, you wicked little thing!' cried Alice, catching up the kitten, and giving it a little kiss to make it understand that it was in disgrace. 'Really, Dinah ought to have taught you better manners! You OUGHT, Dinah, you know you ought!' she added, looking reproachfully at the old cat, and speaking in as cross a voice as she could manage--and then she scrambled back into the arm-chair, taking the kitten and the worsted with her, and began winding up the ball again. But she didn't get on very fast, as she was talking all the time, sometimes to the kitten, and sometimes to herself. Kitty sat very demurely on her knee, pretending to watch the progress of the winding, and now and then putting out one paw and gently touching the ball, as if it would be glad to help, if it might. 'Do you know what to-morrow is, Kitty?' Alice began. 'You'd have guessed if you'd been up in the window with me--only Dinah was making you tidy, so you couldn't. I was watching the boys getting in sticks for the bonfire--and it wants plenty of sticks, Kitty! Only it got so cold, and it snowed so, they had to leave off. Never mind, Kitty, we'll go and see the bonfire to-morrow.' Here Alice wound two or three turns of the worsted round the kitten's neck, just to see how it would look: this led to a scramble, in which the ball rolled down upon the floor, and yards and yards of it got unwound again. 'Do you know, I was so angry, Kitty,' Alice went on as soon as they were comfortably settled again, 'when I saw all the mischief you had been doing, I was very nearly opening the window, and putting you out into the snow! And you'd have deserved it, you little mischievous darling! What have you got to say for yourself? Now don't interrupt me!' she went on, holding up one finger. 'I'm going to tell you all your faults. Number one: you squeaked twice while Dinah was washing your face this morning. Now you can't deny it, Kitty: I heard you! What's that you say?' (pretending that the kitten was speaking.) 'Her paw went into your eye? Well, that's YOUR fault, for keeping your eyes open--if you'd shut them tight up, it wouldn't have happened. Now don't make any more excuses, but listen! Number two: you pulled Snowdrop away by the tail just as I had put down the saucer of milk before her! What, you were thirsty, were you? How do you know she wasn't thirsty too? Now for number three: you unwound every bit of the worsted while I wasn't looking! 'That's three faults, Kitty, and you've not been punished for any of them yet. You know I'm saving up all your punishments for Wednesday week--Suppose they had saved up all MY punishments!' she went on, talking more to herself than the kitten. 'What WOULD they do at the end of a year? I should be sent to prison, I suppose, when the day came. Or--let me see--suppose each punishment was to be going without a dinner: then, when the miserable day came, I should have to go without fifty dinners at once! Well, I shouldn't mind THAT much! I'd far rather go without them than eat them! 'Do you hear the snow against the window-panes, Kitty? How nice and soft it sounds! Just as if some one was kissing the window all over outside. I wonder if the snow LOVES the trees and fields, that it kisses them so gently? And then it covers them up snug, you know, with a white quilt; and perhaps it says, "Go to sleep, darlings, till the summer comes again." And when they wake up in the summer, Kitty, they dress themselves all in green, and dance about--whenever the wind blows--oh, that's very pretty!' cried Alice, dropping the ball of worsted to clap her hands. 'And I do so WISH it was true! I'm sure the woods look sleepy in the autumn, when the leaves are getting brown. 'Now, if you'll only attend, Kitty, and not talk so much, I'll tell you all my ideas about Looking-glass House. First, there's the room you can see through the glass--that's just the same as our drawing room, only the things go the other way. I can see all of it when I get upon a chair--all but the bit behind the fireplace. Oh! I do so wish I could see THAT bit! I want so much to know whether they've a fire in the winter: you never CAN tell, you know, unless our fire smokes, and then smoke comes up in that room too--but that may be only pretence, just to make it look as if they had a fire. Well then, the books are something like our books, only the words go the wrong way; I know that, because I've held up one of our books to the glass, and then they hold up one in the other room. 'How would you like to live in Looking-glass House, Kitty? I wonder if they'd give you milk in there? Perhaps Looking-glass milk isn't good to drink--But oh, Kitty! now we come to the passage. You can just see a little PEEP of the passage in Looking-glass House, if you leave the door of our drawing-room wide open: and it's very like our passage as far as you can see, only you know it may be quite different on beyond. Oh, Kitty! how nice it would be if we could only get through into Looking- glass House! I'm sure it's got, oh! such beautiful things in it! Let's pretend there's a way of getting through into it, somehow, Kitty. Let's pretend the glass has got all soft like gauze, so that we can get through. Why, it's turning into a sort of mist now, I declare! It'll be easy enough to get through--' She was up on the chimney-piece while she said this, though she hardly knew how she had got there. And certainly the glass WAS beginning to melt away, just like a bright silvery mist. 'They don't keep this room so tidy as the other,' Alice thought to herself, as she noticed several of the chessmen down in the hearth among the cinders: but in another moment, with a little 'Oh!' of surprise, she was down on her hands and knees watching them. The chessmen were walking about, two and two! 'It is the voice of my child!' the White Queen cried out as she rushed past the King, so violently that she knocked him over among the cinders. 'My precious Lily! My imperial kitten!' and she began scrambling wildly up the side of the fender. 'Imperial fiddlestick!' said the King, rubbing his nose, which had been hurt by the fall. He had a right to be a LITTLE annoyed with the Queen, for he was covered with ashes from head to foot. 'What volcano?' said the King, looking up anxiously into the fire, as if he thought that was the most likely place to find one. Alice watched the White King as he slowly struggled up from bar to bar, till at last she said, 'Why, you'll be hours and hours getting to the table, at that rate. I'd far better help you, hadn't I?' But the King took no notice of the question: it was quite clear that he could neither hear her nor see her. So Alice picked him up very gently, and lifted him across more slowly than she had lifted the Queen, that she mightn't take his breath away: but, before she put him on the table, she thought she might as well dust him a little, he was so covered with ashes. 'Oh! PLEASE don't make such faces, my dear!' she cried out, quite forgetting that the King couldn't hear her. 'You make me laugh so that I can hardly hold you! And don't keep your mouth so wide open! All the ashes will get into it--there, now I think you're tidy enough!' she added, as she smoothed his hair, and set him upon the table near the Queen. The King immediately fell flat on his back, and lay perfectly still: and Alice was a little alarmed at what she had done, and went round the room to see if she could find any water to throw over him. However, she could find nothing but a bottle of ink, and when she got back with it she found he had recovered, and he and the Queen were talking together in a frightened whisper--so low, that Alice could hardly hear what they said. There was a book lying near Alice on the table, and while she sat watching the White King (for she was still a little anxious about him, and had the ink all ready to throw over him, in case he fainted again), she turned over the leaves, to find some part that she could read, '--for it's all in some language I don't know,' she said to herself. 'But oh!' 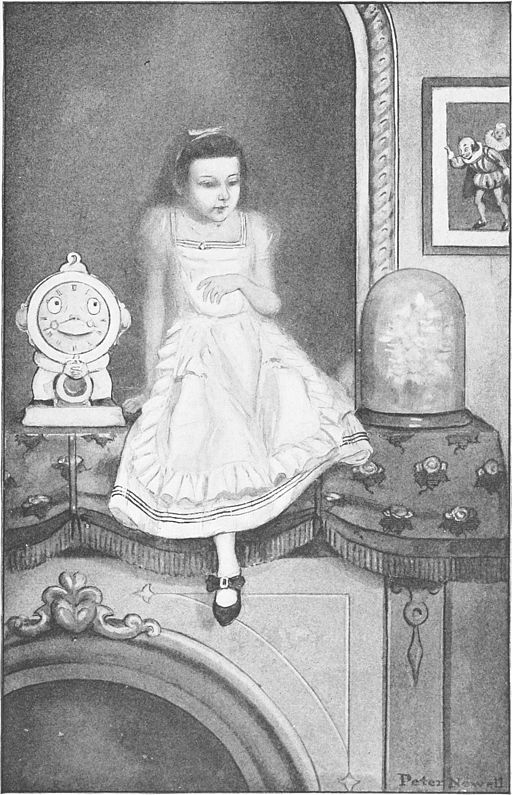 thought Alice, suddenly jumping up, 'if I don't make haste I shall have to go back through the Looking-glass, before I've seen what the rest of the house is like! Let's have a look at the garden first!' She was out of the room in a moment, and ran down stairs--or, at least, it wasn't exactly running, but a new invention of hers for getting down stairs quickly and easily, as Alice said to herself. She just kept the tips of her fingers on the hand-rail, and floated gently down without even touching the stairs with her feet; then she floated on through the hall, and would have gone straight out at the door in the same way, if she hadn't caught hold of the door-post. She was getting a little giddy with so much floating in the air, and was rather glad to find herself walking again in the natural way.